Instructions: Click here to view more photos of this project. The finished box measures 9 x 4 1/4". Cut black cardstock 11 x 11". Score at 1", 5", 6" and 10 1/4" horizontally and fold on all score lines. Score at 1 inch from both the sides vertically and fold on the score lines. For creating the box cut along all the horizontal score lines till the 1 inch vertical score line from both sides, apply double sided adhesive tape on the cut flaps and stick them to the center flap for creating the box. Mat the outside and inside of the box with pattern paper from the collection. Once the top of the box is matted with pattern paper, cut pink color pattern paper 9 x 3 from the paper collection distress the edges and layer with 3D foam tape. Next cut yellow color pattern paper 2 x 9" from the collection, distress the edges and adhere on top of pink color pattern paper with 3D foam tape. Die cut two tags from the pattern paper using Luggage and Tags Die set, distress the edges, overlap them and adhere on the right side of the box as shown. 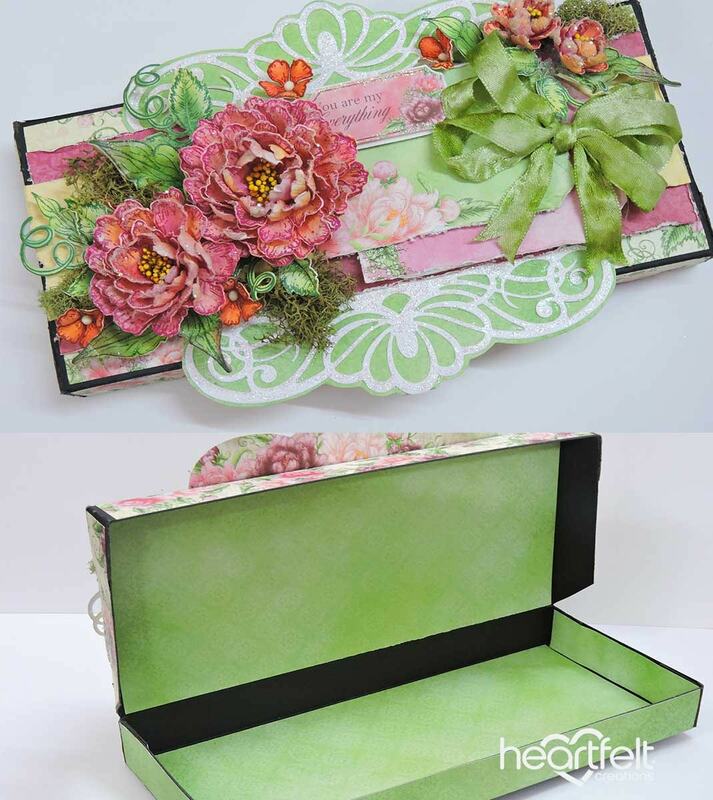 Die cut white cardstock two times with Regal Borders and Pockets Die, mat with green cardstock and paste on the top of the box as shown with clear drying glue. For flowers- stamp with Large and Small Sweet peony stamp sets with Archival ink plum and cut them using coordinating dies. Color the flowers with Color box ink - rose coral, harvest, berrylicious and dark peony. For filler flowers use smallest size petals and color them with Archival ink Tiger Lily. Make sure to color the back of the petals also. 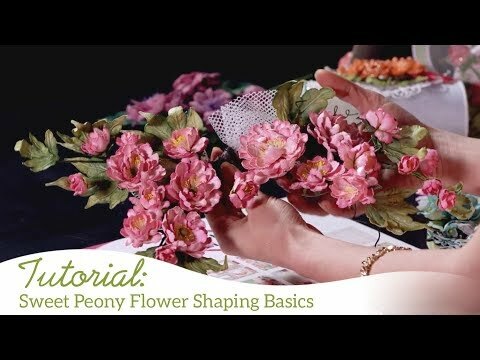 For shaping the flowers use Emma Lou's Video. Leaves - Stamp bunch of leaves from Classic Rose Stamp and Sweet Peony stamp sets with Archival ink library green, cut the images with coordinating dies. Color them with Archival ink - Olive, library green and ColorBox ink - Lime pastel. Color the ribbon with Distress ink Moved lawn, Peeled Paint and tie a bow. Arrange the flowers and ribbon bow as shown. Paste Green Moss here and there randomly with clear drying glue. Cover the flowers with Crystal clear glitter and finish off the box with a sentiment ticket from the collection.